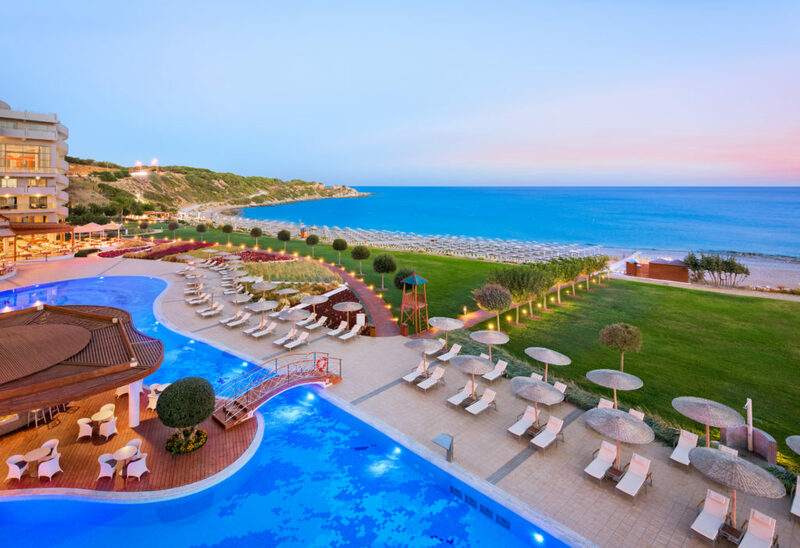 The luxurious 5 star Elysium Resort & Spa enjoys a premier beachfront location right on the Blue flag awarded beach of Kallithea, next to the famous monument of Kallithea Springs, just 9 km from the city of Rhodes. Its imposing architecture consists of a main building with an impressive atrium, 3 panoramic lifts, and two separate additional wings. The hotel features 3 restaurants with fine cuisine, including Noble Gourmet, a rooftop restaurant offering an à la carte unique multi-sensory culinary experience, as well as 3 atmospheric bars. A spacious spa (800 sqm) with 10 treatment rooms offers the world renowned ESPA treatments & products, with its own outdoor heated Vitality pool with hydro massage. Other facilities include a large lagoon style pool (1610 sqm), separate kids pool, free pool & beach sunbeds, free Wi-Fi Internet access, Cybex fitness centre, mini market, rent-a-car, and a free car park.